The classic Chinese quote is deeper than it appears. It’s really referencing customer service, not just smiles. Businesses are constantly in a state of fierce competition, and customer service is a key competitive advantage. Unfortunately, live chat proved to be impractical for many small businesses. The main issue with live chat is that it requires a knowledgeable person to monitor it. There are flaws in this system. If a full-time employee monitors the live chat, they will constantly be pulled away from their work. This problem was exacerbated by customers. Visitors often use live chat at their own pace. Sometimes they wait a few minutes before responding to a reply, keeping the employee in limbo. They are trapped between fully immersing themselves in their work and properly assisting a customer. Moreover, live chat has a risk. When it’s done haphazardly, it angers customers. This can cause the loss of the customer or even public fulminations and complaints. As a result, live chat never lived up to its full potential- at least for most small business owners. Nonetheless, chatbots have recently exploded on the scene like a bomb. Chatbots don’t need a live person to work- it’s all handled by a computer. The savings are enormous, and chatbots are flourishing. The chatbot market will have a 35.2% growth rate each year until 2021. The analyst firm Forrester describes chatbot growth as “crazy”. There’s another tantalizing tidbit here too: email list growth. Smart marketers are using chatbots to expand their email list. If a prospect visits your website, you have no way to get in touch with them again. Unfortunately, most customers won’t give you their email unless you give them something in return. A chatbot is a redoubtable vehicle for providing value a static page cannot. This article will show you how to grow your email list with your chatbot. Why Chatbots Fail (And Don’t Bloom Email Lists)? A lot of chatbots fail. They don’t provide a benefit to prospects, and therefore they don’t bud email lists. Let’s look at the main reasons why. The main problem with chatbots is that many of them don’t understand human language. Take a look at a Facebook Messenger weather chatbot called Pancho. It starts off promising. The user asks if he should wear a jacket. Pancho replies that he should because it’s chilly. After this everything goes off the rails. The user asks if they should wear sunglasses and Pancho gives two non-answers. 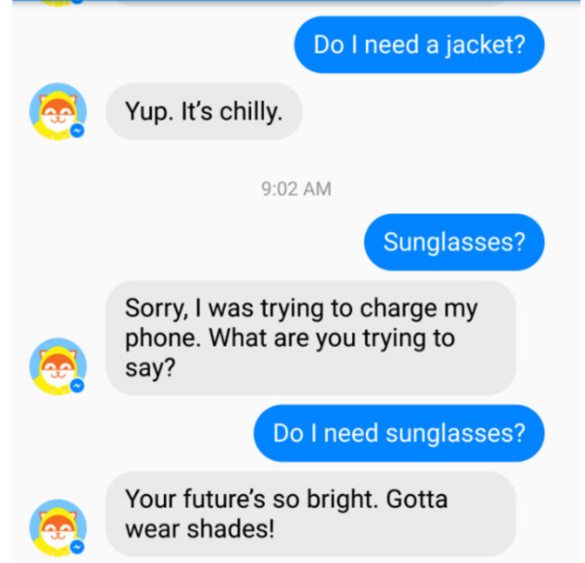 A weather chatbot should be able to give advice on sunglasses. A chatbot shouldn’t sound like a lifeless robot, have bad grammar, or use overly academic language. A good chatbot has a tone, vocabulary, and personality that synchronizes with your brand. When your chatbot is diverting, a fun experience for your customers, then it’s much more likely to have success. 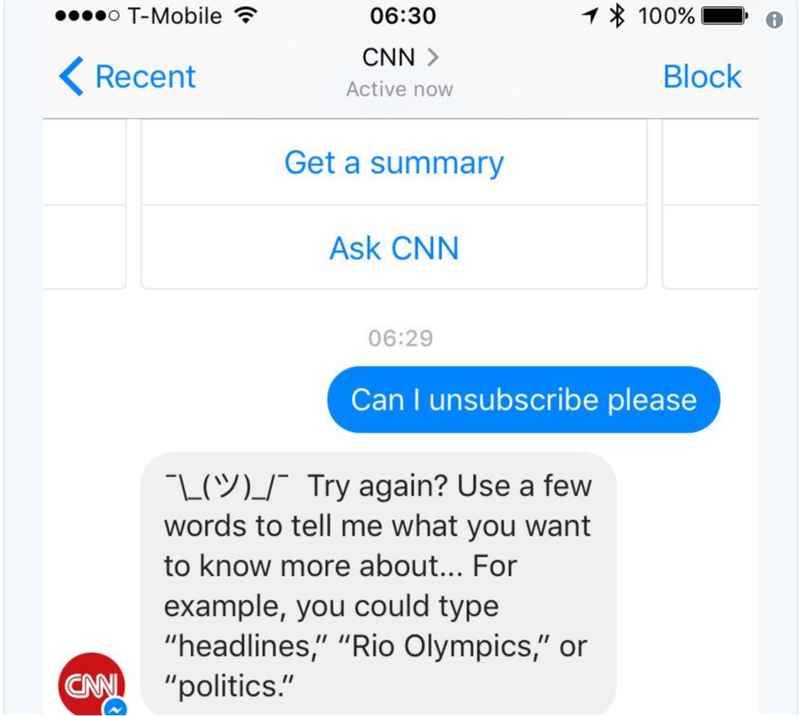 Take a look at the CNN chatbot above. It doesn’t help users who want to unsubscribe. Many bots make you type in (with exact wording) “unsubscribe” or “stop”. Other prompts -even close ones- won’t help you. A good bot is helpful and helps users unsubscribe when they want to. As CNN can tell you, this is bad PR. Borderline spam tactics like these caused Facebook to currently preclude new chatbots on Messenger. Facebook is worried about chatbot spam and utility. What Are the Features of a Great List Growing Chatbot? Now you know the biggest weakness with chatbots. The two main pitfalls of chatbots are ineffectiveness and sub-par copy. Let’s explore some questions relating to good chatbots. Should You Give Your Chatbot a Name? Giving your chatbot a unique name facilitates people finding it via a Google search. A fantastic way to name your chatbot is to choose a name based on what it actually does. For instance, Translatebot is the name of a chatbot that automatically translates content you send to it. Using your brand name isn’t usually recommended unless it’s a descriptive name. For instance, the “TripAdvisor Bot” is a praised name because it’s the brand name of the company and because the bot will advise you on your trips. Don’t make your name too long. For example, the name “Clean Your Email List From Spam Traps Bot” is way too long. A good name should be descriptive and catchy. Finding that balance is the key to good naming. Should You Give Customers Multiple Choices? How can you possibly prepare for every written contingency? How can you possibly be ready for the myriad of things your prospect might ask? The truth is that you can’t. A lot of chatbots fail because they can’t engage in natural conversation with people. Clever small businesses owners realized that, and they added in multiple choices to guide the conversation. If you’re looking to start with a basic chatbot, this feature is a lifesaver. It really limits the amount of programming that you have to do. To make it work, however, you need clever copywriting, and a keen sense of what your customer really wants. Also, it’s important that you never just give the customer one choice. Always make sure a “yes” or a “sure” is counterbalanced by a “no” or a “not now”. Chatbots are about user conversation, and conversation is always a two-way street. Is Hiring a Chatbot Copywriter Worth It? In order to capture more emails, your chatbot needs to provide value. This makes asking for an email much easier. Your main weapon in doing this is the written word. Your copy must accomplish many feats. You want to be funny, but you don’t want to be inane. You want to provide insightful answers to questions, but you don’t want too wordy. You want to farm viable email addresses, but you don’t want to be pushy. These are nuanced tasks. You can use the Hemingway App to obviate the clunky parts of your copy. Additionally, you can use Grammarly to check for grammar errors, ensuring you turn out clean copy. These tools are invaluable. However, it takes serious spadework to be punchy. There’s no shame in outsourcing to a professional. Why Is Benchmarking My Rivals Important? In the unlikely event you’re looking to break into the translation chatbot market, Instant Translator is a fantastic place to start benchmarking. Yet, it won’t help much with other industries. Benchmark the top companies in your industry and purloin their chatbot ideas. Should I Ask for Their Email in the Beginning? 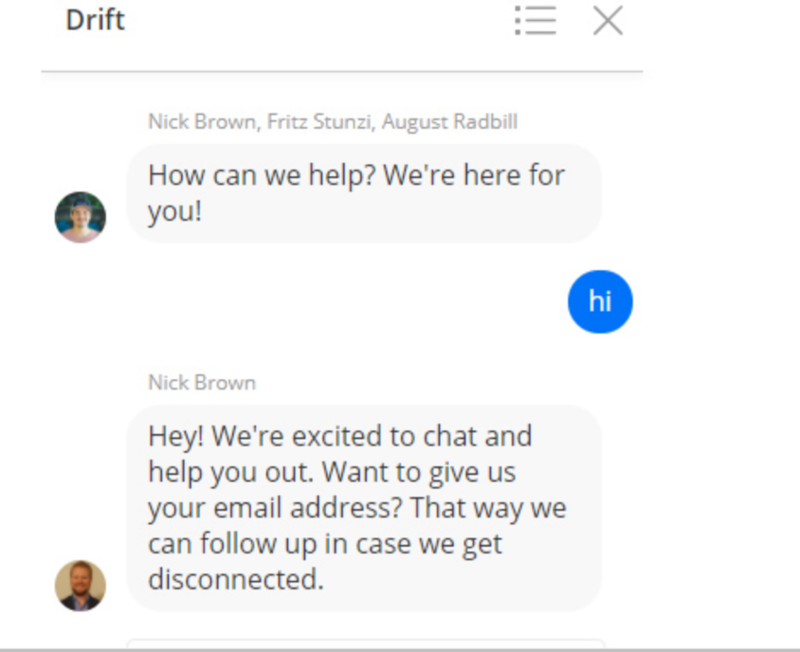 Look at this chatbot from Drift. The chatbot tries to grab the email at the very beginning of the conversation. This tends to turn people off. Telling customers you need their email just in case you disconnect is too clever by half. Of course, it seems polite, but customers know what you really want. Instead, you should apply the foot-in-the-door technique. This is a psychological tactic that helps you secure a large request by asking for a small request first. The small request doesn’t even have to be a request, per say. As a matter of fact, you just want to get prospects to answer questions. This ties in with another potent psychological principle, the escalation of commitment principle. If a prospect spends significant time with your chatbot, they’re much likelier to leave their email. The easiest “no” is the one right out of the gate. It makes sense; they have no reason to be invested at that point. Should Chatbots Entertain? Aren’t They Here to Flourish Your Email List? Yes, chatbots should entertain. It enhances your brand and ultimately makes it easier to ask for the email. One great way to entertain is to give your chatbot a persona. Maybe it’s a snarky guy or perhaps it’s a shy girl. Giving your chatbot personality is the first step to entertaining your prospects. You can also include images, gifs, and questions to liven up the conversation. How Do You Ask For Email Then? Chatbots are robots, but it doesn’t mean the fundamental rules of gathering emails has changed. Emails are currency, and you have to give something valuable in exchange for them. Your chatbot can offer the reliable staples: an ebook, a checklist, a newsletter, an infographic, a case study, a webinar, a podcast, an exclusive interview, a phone conversation, or even a trial offer. Yet, a chatbot can also excite prospects with free tools. For example, let’s say you have a chatbot that calculates how much an article is worth. The chatbot asks you to insert the URL of the article. It judges the article by simple metrics, including the length of the content, the comments on the article, and the number of images used. This theoretical chatbot could easily spit out a price. However, the chatbot could calculate more stats, such as the average time it should take to create such a piece of content. It could then proffer those advanced stats to people who give their email. Chatbots are a great fit with free tools. This strategy ties in wonderfully with the escalation of commitment principle. Okay, I’m Sold on Chatbots. What’s the Best Chatbot Platform to Use? There is a profusion of chatbot platforms out there. Chatbots News Daily has a list of 25 of the best chatbots on the market. That list is only the tip of the iceberg. There are many chatbot companies: Chatfuel, Drift, ManyChat, Collect Chat, Chatty People, Memokay, Smooch, and a cornucopia of others. Where do you even start? There isn’t a clear-cut option that wins with features or price alone. Many chatbot platforms will allow you to get started for free, and they have more features than most beginners know what to do with. Take Chatfuel for example. Their pro plan ($30 a month) allows you to remove the Chatfuel branding, see a data-rich list of chatbot users, and enjoy quicker email support. These are great features, but the free plan is still excellent. What Chatbots Do You Recommend? Chatfuel and ManyChat are two of the best choices for beginners. They both have robust free versions, and they’re both well-known and successful platforms unlikely to fail. This is a nice bonus upstart companies don’t have. Your chatbot will experience a disruption in service if the parent company cuts bait. Here is a link to a Chatfuel tutorial and a ManyChat tutorial. These tools only work on Facebook Messenger. Does It Really Matter Which Chatbot I Start With? It’s wise to start with a free chatbot. There are so many robust free options. Nonetheless, ease-of-use is more critical than price. Check the tutorials on YouTube before you start building your chatbot. Pick a chatbot you or your programmer feel comfortable with. In a world of online businesses, how you can you have the best customer service around? People expect service 24/7, but the average small business doesn’t have the manpower for that. Fortunately, chatbots can help. Chatbots aren’t all-powerful. They won’t replace emails, phone calls, or even live chat, but when made properly they provide lots of value. They allow prospects to have positive experiences with your brand at any time. Chatbot technology is straightforward. You can build them on your own, or you can outsource the script and flow on Fiverr. Chatbots also allow you to grow your email list, an investment with a 4,300% ROI. Chatbots are the new smiling faces in your online shop.